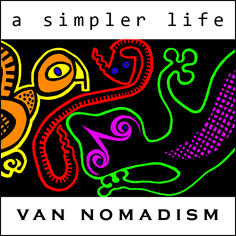 This page is all about living in a van. Based on our experience of converting one, travelling through Spain & Portugal, and what we learnt from all the other nomads we met along the way. It’s not an easy way to live, but if like us you need a way to find your place/ search for land, then it is the only way. We’d never done anything like it before, and so made plenty of mistakes, hopefully after reading this you will have a much more rewarding experience. First off, wild camping, as it is more commonly known (parking for an extended period outside an officially recognised campsite) is probably illegal everywhere by now. This doesn’t mean you can’t do it though. Thousands upon thousands of van nomads (yes there really are that many people living outside conventional society) plus all the conventional campervanners continue to park up this way. You just have to think and behave to attract the least amount of attention and trouble. Like a tourist for example. Always ask at the local town hall (or police station) if it is okay, and where would be best. Or turn up really late, when officialdom has gone home (police in rural areas work office hours), making sure to be away early enough the next morning. Don’t park in large towns or cities. Not just because the police will be a lot more zealous (they will, especially if you have foreign plates), but in these kinds of places there’s a real possibility of violence/ theft from drunks/ drug addicts/ and disenfranchised youth. Always park in the most visible/ public and well-lit places. Two popular choices are supermarkets and lorry parks. If you need to stay somewhere for longer than a night (or two) then it is best to find someone local who has a piece of land to rent, so you are technically off the road. And if it’s for an extended period this means you can also have the local Post Office save you’ll mail (or even deliver it). At the very least, parking up for a while allows you to get loads of washing done/ dried/ and to get to know the neighbourhood. There is a law in the EU which states you cannot drive a vehicle (from another country) for more than a set number of days (I’m sorry I don’t know how many) without having it re-registered in that country. Punishment if caught is seizure of the vehicle and a substantial fine. How they enforce this one is a mystery, but it can happen. A couple of ex-pats near here were done, but only after falling out with a neighbour who then reported them. They were stupid, as generally the police don’t go looking for this kind of trouble. If you are ever worried, just drive to the nearest border and cross over, have a coffee then come back again. You’re also supposed to tell the DVLA if you are going abroad for an extended period (though they don’t specify what that is). I guess too, keep your Road Tax up-to-date, though if you no longer have an address that is going to be tricky. I have never known anyone to be asked to produce their tax disc. Possibly because every country has a completely different way of doing it, so the police wouldn’t know what they were looking for. Policeman rarely speak/ understand English either, so always smile and be ultra courteous, it will get you out of all sorts of trouble. You must have insurance for the van (along with a green card), and your insurer has to know (in writing) it is a conversion. However it doesn’t have to be with a UK insurance agent, any member country can offer cover. This could work out to your advantage. Here for example, third-party isn’t any cheaper but it does provide full protection for all the glass, plus free recovery to the nearest garage whenever (and wherever) you need it. Keeping the MOT up-to-date is another grey area. We made sure it was just in case there was a claim on the insurance. In some countries (Spain for example) vans over 10 years old are required to be inspected every six months. The centres can also be a lot stricter than in the UK, as well as not sure what the law is about right-hand drive vehicles, so make sure you go to a mechanic first and have them do a pre-test inspection. If you are mechanically challenged (like us) then keeping the MOT up-to-date is also a perfect way to keep on top of potential problems, especially as in some rural areas you can wait up to three months to get repairs done. Remember to carry all the mandatory emergency equipment, which must have the appropriate EU kite mark. Stuff like reflective triangles (often more than one is required)/ reflective vest/ spare tyre/ spare light bulbs/ fire extinguisher/ etc. Each country has its own list. Plus you’ll need to carry at all times the vehicle’s documents, including all the previous MOT paperwork + receipt/ current driving licence (do not let this expire or have less than a month left)/ and passport (which have to be on you at all times anyway). Photocopies of any of these are not acceptable. If you are intending to park up somewhere for more than a few weeks life gets a bit more difficult. You might have to register as a resident. First at the local Town Hall, which isn’t anything sinister (it’s so they can claim more money from central government) and probably free or no more than a few euros. Then the painful (and expensive) bit. A national residency certificate or identity card. In Spain they take this very seriously. You are technically an immigrant, so the Police have to make sure you are entitled to be in their country. Which includes them having several copies of an up-to-the-minute photograph of you and fingerprints. To make matters worse there is only one office in each region, typically situated several hundred kilometres away from where you are. To which you’ll have to visit several times. You’ll probably need an appointment too, and even then have to queue on the day, so get there well before the time stated. Make sure to take ALL the papers you have (photocopies are not accepted) or you could be turned away. We did really well, compared to people we’ve met since, but still nearly went mad trying to get it all sorted. But at least you come away with something, and that’s the vital identity number it gives you, without which life is virtually impossible. Providing you with the right to claim the same kind of unemployment and social security benefits as in the UK, and free NHS health care. Finally, you’ll need to surrender your UK driving licence, to be issued one of that country. This is done at the equivalent (one and only) regional office of their DVLA. And it’s like doing the residency bit, but this time the staff are all sadists (and in the case of foreigners usually have no idea what they are doing). Keep your cool, it’s not personal, they treat everyone like this. It’s also going to cost money too. Including paying for a medical test. But don’t worry, it’s nothing serious. You get it done at the local health centre, and involves no more than a few health questions (mostly about your state of mind for some reason)/ a quick test of coordination with an ancient video game/ and a test for colour recognition. There is no physical examination, nor will you be seen by a doctor. A final word of advice, do not let your UK licence expire before attempting any of this. In some countries (Portugal for example) you have to park in the same direction as the traffic flow. Make this a habit and you won’t get caught with a on-the-spot fine. Be aware too of all the yellow/ blue lines and any other restrictions that might apply. Some local police are really zealous about these and make a nice extra income from enforcing them. When choosing a place to park always consider the potential for damage by other drivers and disenchanted youth. In some countries most of the older citizens will never have taken any kind of test/ 20-20 vision/ or learnt anything from their years on the road, so the potential for being bumped/ scratched/ or having bits torn off (always fold in the side mirrors) is always there. Countries new to car ownership also tend to treat the idea of driving as if they are in a video game, oblivious to the real dangers. Expect to be overtaken, even if it’s on a blind bend or with on-coming traffic. And be eternally vigilant to spot the most stupid thing imaginable, ready to take evasive action. If you get flashed at or hooted don’t panic. It’s either they’ve thought to let you know they are about to do something, or they want to stop and rob you. Getting pulled over by the police (traffic and local) is probably going to become your worst nightmare, because it is everyone’s. Each day (thankfully at the same time and in the same places) they mount a roadblock for an hour or so. Generally it’s on the faster and busiest routes, but they also haunt anywhere there are tourists. The secret is to travel outside office hours, stay on the smaller roads, and always keep an eye out well ahead. In towns where there are tourists they adopt an added approach. By hiding out in a side street, watching for foreign plates, then suddenly appearing behind you. Always observe all the traffic signs (maximum speed and STOP especially), even if it irritates the hell out of everyone else. And if they do choose you expect to be asked to pay (in cash) for some bogus infraction. The only way to avoid this is to make you have nothing more than loose change and no ATM cards. And to brazen it out. Do not try to speak in their language, just keep repeating you refuse to pay. They will try and intimidate you (with a show of their guns and by calling for reinforcements). Stay cool and demand to be taken to the police station. If it comes to that, ask to make a formal complaint. They should give up at some point, but be ready for it to take all day. Keep in your mind that it’s your money, and you are dealing with the law here but just a bunch of kids in uniform who are a lot more frightened of what you could do. Oddly enough this was never an issue. Because we always kept away from cities/ large towns, and in the tourist spots parked up where there were a lot of people. The only case we’ve heard of was when a friend went for a swim on a deserted beach and came back to find she been broken into (and had all her papers stolen). Take a bike to get to those kinds of places. Do not install an alarm. They just get ignored or irritate people sufficiently to try and turn them off. Obviously you’re going to get what you’re prepared to pay or the work put into it. But if your plan is to eventually trade it in, bear in mind to spend no more than is economic. Including the cost of returning it to the country of registration, and the only buyers will be fellow nomads who have little or no money. Far better is to plan on keeping it. This way you get to travel with the best level of accommodation, having chosen the right kind of vehicle can have it re-registered, then when you do find a place to live permanently use it for the house building phase (neatly circumventing laws on caravans and mobile homes), and afterwards as additional accommodation for friends to stay. You should always choose the biggest van you can afford. This is to retain your sanity. It is not natural or pleasant to be confined in such a small space for any length of time, especially when accompanied by all your belongings/ pets. You need the maximum amount possible/ the maximum potential for carrying stuff (permitted by your licence)/ the maximum interior headroom/ and sufficient width to put a bed in sideways. Don’t worry if it looks like a lorry, anything that can be driven on a normal licence can get round the tinniest pueblos. Contrary to logic, bigger vehicles do not consume substantially more fuel (our 2.5 litre DAF/ long-wheelbase/ with 4 wheels on the back and rear-wheel drive, managed an average of 45 miles to the gallon). They are also much easier to drive, the seats are better, the raised driving position gives a better view, and the coach-style steering wheel angle is more comfortable. A high body clearance also makes them good for roads/ tracks that don’t have tarmac (very useful in Portugal). The only thing ours didn’t like was mud or sand, especially with a camber (I turned it over twice like that). You need to choose a make that can be repaired anywhere, especially the engine. We thought our model was like that (every public service in the UK used them), but no-one in Portugal would touch it, and in Spain we had to get the parts shipped out. I would therefore recommend a Mercedes (particularly the Sprinter, and the minibus version). Obviously it has to be with a diesel engine, at least 2.5 litres, and left-hand drive. Metal roof, not fibre-glass. This lasts much longer, and you’ll need it to fix/ take the weight of a solar panel, as well as resist the heat of the stove pipe. The best van we ever saw was ex-NATO military truck, I have no idea what. But it was really high and looked so solid there didn’t seem to be anywhere it couldn’t go, probably bulletproof too. I would imagine well looked after too. Worth finding out who sells them and at what kind of price. We only had three months to do all ours in, and even with working full-time/ seven days a week that really wasn’t enough. If like us you also have very little or no experience at this kind of thing, allow at least twice that. Also bear in mind everything has to be as light as possible, as the weight soon mounts up. If at any point you are unsure you can get it tested (for a fee) at a public weigh-bridge. That will tell you the load on each wheel/ axle, compared with the maximum permitted which is printed on your van’s VIN plate. When we got ours (in part-exchange for a much better and newer smaller one, no cash involved) it looked awful. The previous owners (several small businesses) obviously had not treated it well, despite a full-service record. As well as finding various alien life-forms flourishing throughout, a new speedo had been installed (set at nought), all the rubber flooring had to be removed because water was trapped underneath and rusting the metalwork, and the exterior looked like it had been used for demolition derby, so badly the rear doors had to be removed and a metal sheet welded over it. But at least no-one had attempted to build anything inside. We started with washing it all down (which took two whole days). Then I built and bolted a wooden frame to the metal wall struts. This was to nail tongue & groove panelling, under which went a thick layer of insulation. On top of that the rest of the fittings would be bolted, as we wanted to be able to remove them afterwards and use them in our new house. Deciding what would be needed was really difficult. Neither of us had ever been campervanning before, and the ones we went to see for ideas we didn’t like at all. Luckily the lack of space limited the choices. Apart from the floor there was nothing level to measure from, so I settled for building all the units freestanding and then work out ways to bolt them on. The materials used were from diy superstores, so much heavier than in conventional campervans, but then we didn’t want to anything containing solvent or plastic. The bed took the longest to work out & build. There wasn’t the room to put it across the back, nor high enough to go over the cab, so we put it down the side with the sliding door. In order not to lose all the floorspace I copied the idea of a futon/ sofa-bed, the size of a single mattress but hinged, so at night it opened out as a double. We used a futon, so one half became a backrest during the day. I think a bunk bed would have been a lot better, with the lower part doubling as a sofa. On the opposite wall was a continuous worktop with cupboards underneath, and the cooker. Books and small things went on shelves (with fronts) on the walls. a lightweight 12 volt/ 150 watt solar panel. Mounted on the roof (with waterproof plug for quick detachment). Do this in a way so there’s a gap underneath to allow air to circulate. You will also need to add a deflector in front to stop drag & noise when driving. a 250Ah auto battery as the power source when it is dark. plus 12 volt led interior lights and a car stereo for music/ radio. We made a special metal cupboard for ours, on an outside wall and welded in place/ air-tight. Access was from the outside, with a lockable door that had a rainproof vent at the top. Plan on using the large domestic type of butane bottles (camping gas is far too expensive and hard to find). In Spain and Portugal they are used by everyone for cooking and heating (mains gas is only available in cities) so readily available. They are big and heavy though, around 60 cm high x 30 cm diameter, and I guess weighing around 25 kg. But for this you get at least eight weeks use. Priced at around 15 euros. The first one requires paying a refundable deposit, then after that you simply swap with a full one. Most commonly found outside supermarkets/ petrol stations/ and rural bars. There are usually at least two or three brands, and two types – the standard or lightweight. The difference is the latter contains less gas and is more expensive. You will also need a valve. Hardware and domestic appliance shops sell these (ask how to put them on, it’s not easy the first time), plus a short length of 9mm rubber hose and jubilee clips to connect it to the appliance. If you have more than one appliance you’ll need a copper t-piece. The hose is guaranteed to last five years and comes with the expiry date stamped along it. Apart from working out how to strap the bottle down safely, the only other worry is being asphyxiated by a leak. We built a special ventilated cupboard (like the one for the battery, and also only accessible from the outside), except got the measurements wrong and the bottle wouldn’t fit in it. Much simpler is to stow the bottle inside (strapped to the wall) and get into the habit of turning off the valve every time you finish using it. Don’t run a heater off gas, it creates far too much moisture and is probably toxic. Vans are seriously cold in the winter (and excruciatingly hot in the summer – see the bit about awnings). Even in southern Spain, and ours was fully insulated (including under the floor). They get really damp too, from condensation. The answer is a small wood stove (it will also dry your washing). Securely bolted down and sitting on a sheet of metal, so any embers that fall out don’t cause a fire. Hardware shops here and in Portugal sell them, though typically only during the winter. They are cheap too (less than 100 euros) and lightweight, but only last one season typically. Same goes for the standard enamelled flue. Personally I would install it during the conversion. This way you can buy a good one that will last forever and can be used in your future home (the Morsø Squirrel for example), with a stainless steel flue. Make sure it goes straight up and is as far away from the solar panel as possible. Fit a hat on the top to prevent sparks and the rain getting in. When using the stove, burn it as hot as possible to keep the flue clean, and sweep it flue as well. You’ll also need somewhere to store and keep firewood dry. Our van didn’t have any so we installed the bus/ canal boat type, which are about six inches high, come in different lengths, and slide open. We chose these because no-one could break in, and made it difficult to see in. Not such a good idea. It made it very dark inside, difficult to look out, and mosquitoes loved using them. In the roof we fitted two small (30 cmx 30 cm) skylights, which tilted in different directions to catch the slightest draft and had mosquito screens. We should have gone for a much bigger size. Two people require up to 75 litres a day (including washing). Conventional campervans use a water tank for this. Which obviously works but it also adds significantly to the load (1 litre = 1 kg)/ the water gets stale and algae forms very quickly/ and it must affect the handling when driving. Filling would be a problem too, away from a campsite. We used instead 5 & 25 litre containers, the latter strapped down, and had a lightweight shopping-trolley frame to carry them for re-refilling. In the villages of Spain and Portugal this was done where everyone else gets their drinking water from, a local spring. Just ask where the nearest one is. Clothes washing is a big problem (particularly drying them). There are few launderettes outside big towns/ cities. You do it when you can or visit a campsite. Body washing is a lot simpler. Either boil a saucepan of water, pour into a bowl (with the juice of a lemon) and dilute with cold water, using a flannel to wash with, doing the cleanest parts first. No need to rinse off afterwards. Or visit the public baths. In Portugal every town has one, fully-staffed, very modern, and it costs around a euro for a hot shower (take your own soap & towel). You can buy really good stoves for caravans and boats, with all the same facilities as conventional ones, but on a much smaller scale. Ours has two gas burners/ a grill/ and tiny oven. It cost a small fortune, but has lasted twelve years in daily use so far/ is very economical/ and perfect for baking bread. With such a small space you will have to adapt to buying smaller quantities and shopping more regularly. Also that, outside cities, supermarkets are going to be a rarity. As is much of what you might consider now to be essential. The best place is the local fruit & veg market, because a large proportion of what’s on offer will have been grown by the stallholders themselves, so it will be fresh/ in season/ and a lot cheaper than any shop. They are open generally only in the mornings, probably not Monday, and sometimes only Saturday. Do not waste precious space (and money) installing a fridge, keep that kind of stuff in a polystyrene cool box. It is essential to take your own mattress, along with the usual arrangement of duvet/ sheets/ blankets etc. We tried to cut corners with sleeping bags, they were a disaster, freezing cold and really uncomfortable. Also you will need a mosquito net. From day one we wished we’d got one of these. It keeps the doorway area dry/ is somewhere to hang out washing & wet things/ and adds to the available space. Best of all it stops you going mad. Have a go at making one rather than spending a fortune on a campervan version, and bear in mind it can be really windy at times. This is another thing we left behind (to keep the weight down) and turned out to be absolutely essential. Not only for the odd bit of emergency diy, but to use later when building your new home. The tools here are rubbish. Take as many/ as wide a range, as you can find room for, especially hand tools. Also: a portable work-bench/ extension lead (25m or more)/ digital multimeter/ soldering iron/ digital tyre-pressure gauge (check tyres weekly) & foot pump/ fire extinguisher/ distilled water (for the battery)/ wind-up & solar torches/ and if your van has six wheels an extension piece to attach the air hose. If you need to see a conventional (NHS type) doctor at any time there are health centres in most towns (hospitals though can be up to 100km away), and even without residency as an EU citizen in another EU country you have the same rights as in the UK. In an accident try and get yourself to a health centre / hospital as ambulances can literally take several hours to turn up. To avoid being presented with a bill after treatment give them your European Health Card on admission, or if you have a residency identity number that. Alternative medicine practitioners, especially homeopaths and acupuncturists, are commonplace. Expect to pay around 30 euros a session and around 5 euros for tablets. There are pharmacies in every town, and they can get homeopathic remedies within 24hrs. Buy the most comprehensive first aid book you can afford, and always carry a full selection of medicaments/ first aid materials. When we first set out (in 2000) it was almost impossible to find an internet café, I’d never heard of wi-fi, and we had just three friends with email addresses. Now at least one bar in every town allows you to surf (and recharge your laptop battery) for free, and most office supplies/ stationery shops can print documents from a pen stick. 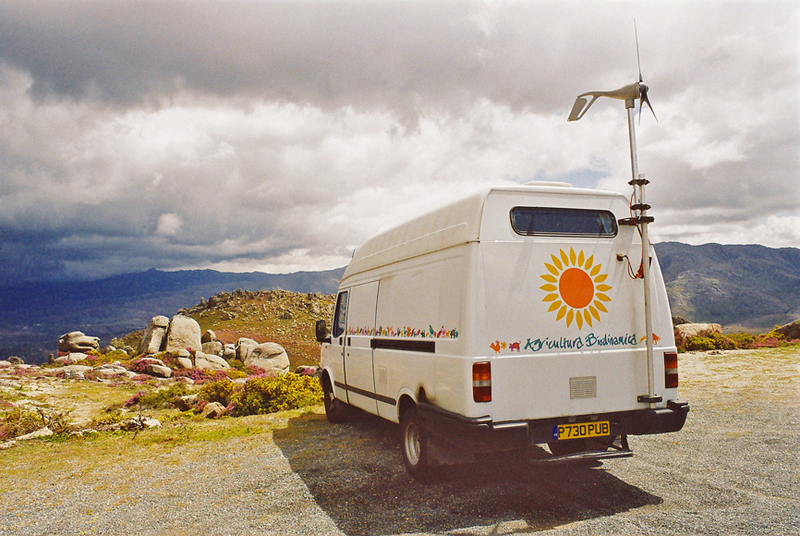 Other campervanners are a great source of information and support. Don’t ever feel shy about parking next to one and knocking on their door to say hello. Generally they love the company. We’ve shared many memorable evenings like this, with people from all around the world, and because they all have had such different life experiences, learnt far more from them than we could have otherwise ourselves. a good topic with excellent advice, thank you! Just spent a day reading your site; what a strong/practical person you are, well done. I’m not/haven’t been a ‘green person’ but you put a very strong case for going done that line, you’d be the ultimate neighbour. Sorry for your loss and hope you find true happiness with your new partner. Best wishes. Andy.